With the support of UNDP and GEF, the national and state governments are working with communities and sector institutions to implement biodiversity-sensitive fisheries and ecotourism practices. India is the second largest producer of fish in the world, and, for most of the country’s coastal communities, the sea has always provided their food and income. 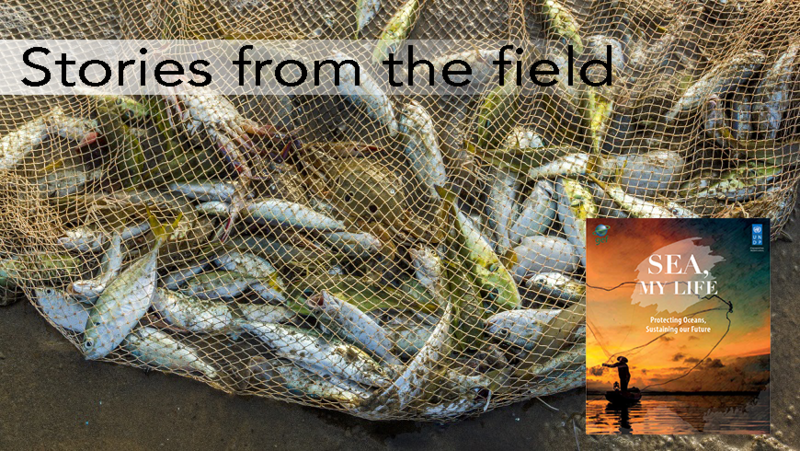 In recent decades, greater demand for fish, driven by a growing population, changing market forces, and increased commercial fishing activity (including illegal fishing) to meet global fish demands, has resulted in serious supply shortfalls. Declining fish stocks and catches, and other signs of environmental degradation, such as damage to coral reefs, rang alarm bells for the Government of India, prompting them to initiate a mainstreaming project to restore the ecological balance of the Sindhudurg Coastal and Marine Ecosystem. With the support of UNDP and GEF, the national and state governments are working with communities and sector institutions to implement biodiversity-sensitive fisheries and ecotourism practices, rehabilitate degraded sites such as coral reefs, protect endangered species, and mobilise people and to manage and reduce pollution. The Sindhudurg mainstreaming project has invested heavily in a multipronged approach to improve the sustainability of the fishery, protect the rights of access of artisanal fishers, act against illegal fishing activities, and build sectoral partnerships to diversify and improve the livelihoods of coastal communities. As part of this initiative, the Maharasthra Departments of Forestry and Fisheries are working with fishing communities to adopt more sustainable practices and fishing gear that reduce bycatch, keep offtakes within safe ecological limits, and protect sensitive habitats that are crucial for breeding success of threatened species. The project is also working to reduce fishing pressure by creating new opportunities for sustainable livelihoods, especially for women and youth. These include value-addition to fisheries operations, production activities such as small-scale farming of mangrove crabs and oysters, and a range of activities linked to responsible eco-tourism. The coast of Sindhudurg has become increasingly popular as a tourist destination and, whilst this has been good for stimulating the economy, it has resulted in greater pressure being placed on fragile marine ecosystems, especially coral reefs. To address this, the mainstreaming project has supported awareness-raising and skills development to promote biodiversity-sensitive practices and increase capacity for managing potential negative impacts. Youth have been trained as certified scuba divers, well-versed in responsible marine tourism best practices. These young people can now earn reliable incomes as marine tour guides and serve as agents of change in their communities, spreading their knowledge of marine conservation and its importance. The trainee divers contribute to the restoration of degraded habitats by removing discarded fishing nets from the sea bottom, and performing rescue and release of animals that have become trapped in these ghost nets.